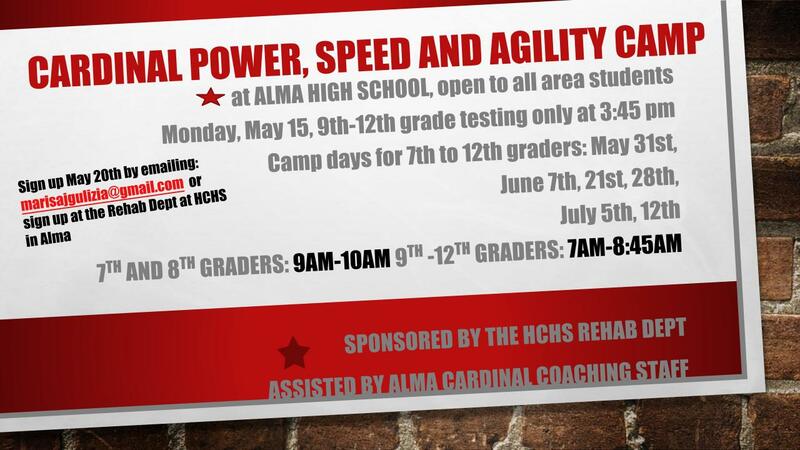 Coming again this Summer: The HCHS Rehab Department assisted by the Alma HS Coaching Staff is offering a 6 week long Power, Speed and Agility Camp to students from all area schools. Your youth athlete will be instructed by knowledgeable and experienced coaches and trainers that have been well educated in the movement patterns and biomechanics of top athletes. Efficiency in movement can decrease the risk for common sports related injuries, provide good technique and mechanics, strength, stability, control and flexibility. 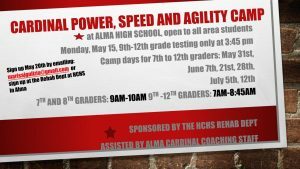 Camp activities will help the student athlete to improve their form and speed, provide skills to improve quickness, techniques to enhance explosiveness, methods to improve balance and coordination and assist in conditioning by improving linear and lateral acceleration and deceleration, change of direction mechanics, jumping and landing mechanics and neuromuscular coordination to help prevent future injury. Dr. Finkner is by no means a new face to the patients in Alma. 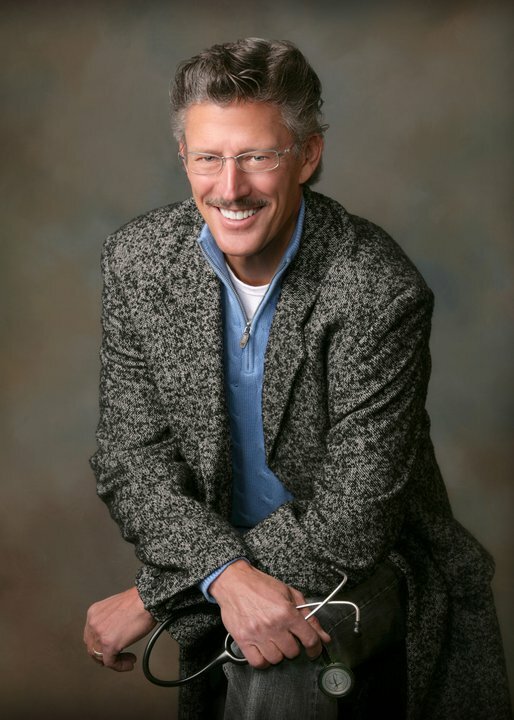 He was in private practice in Alma from 1980-1988 and has in recent years been assisting with clinic and emergency room on-call duties. Much to the excitement and pleasure of the HCHS Board of Trustees and Administration Dr. Finkner has recently chosen to join HCHS as an employee. He will be available to see patients in the Alma clinic on Mondays, Tuesdays and Wednesdays starting in July. When asked what prompted his decision to become an employee of Harlan County Health System, Dr. Finkner stated that he has always maintained a love for our community and feels a true calling to finish out the last 7-10 years of his medical practice here in Alma. Dr. John Michael Finkner graduated with honors from University Of Nebraska College Of Medicine in 1975. He practiced in Alma from 1980 – 1988 and then became the Director of Emergency Physicians at Good Samaritan Hospital for the next 18 years. His extensive background in Family Practice and Emergency Medicine gives him a broad range of experience that he will continue to share with the patients of Harlan County Health System. Originally from Minden, Dr. Finkner lives in Kearney with his wife Kathy. The couple has four adult children, and 14 grandchildren, all under the age of 10. Dr. Finkner enjoys competitive running, fishing, landscaping, shopping with his wife, traveling and visiting his grandchildren. Dr. Finkner will be taking over duties of Dr. Michelle Durr, who will end her services with HCHS in July. Dr. Cameron Knackstedt appointed President of the Kansas Osteopathic Foundation. Dr. Cameron Knackstedt, D.O. 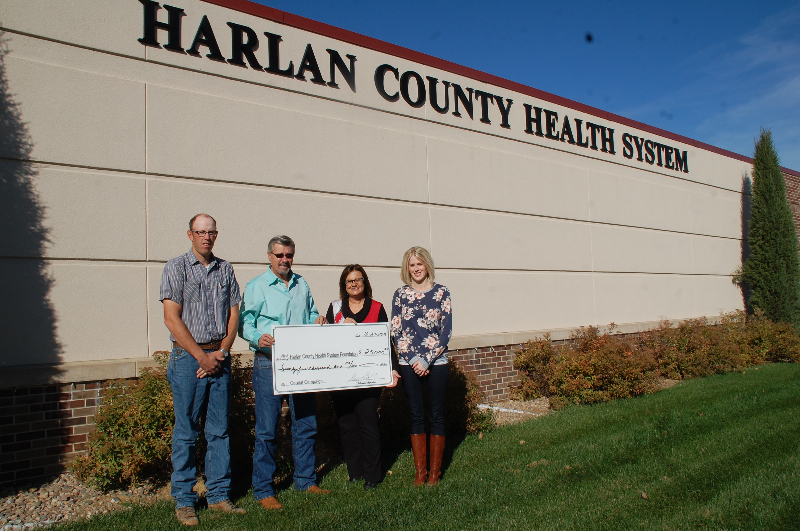 at Harlan County Health System recently attended a meeting of the Kansas Association of Osteopathic Medicine Annual Convention. At the convention he was appointed to the position of President of the Kansas Osteopathic Foundation. 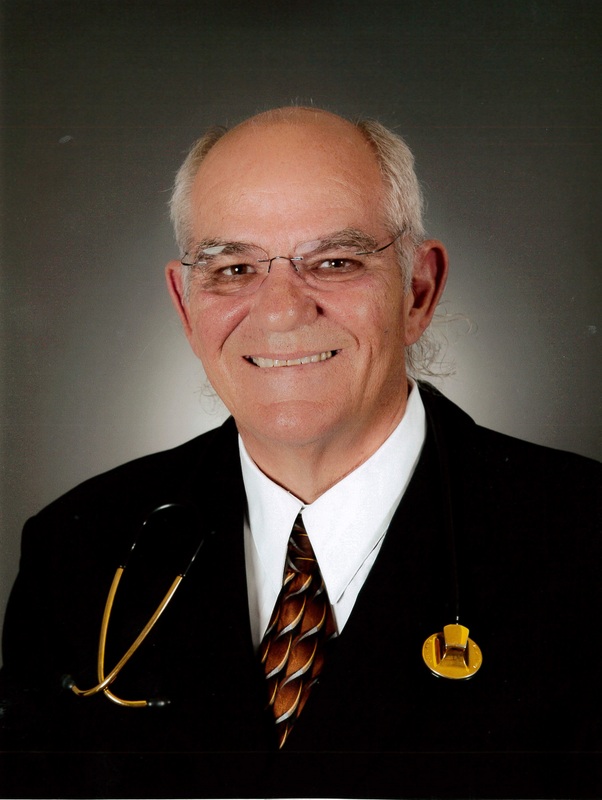 In 2013 he was awarded a Fellow in the American College of Osteopathic Family Physicians. During the UCME program, Dr. Knackstedt (Dr. K) attended medical lectures on medical topics such as advanced heart failure and transplant, geriatrics, maternal fetal medicine, Association healthcare update, two lectures on diabetes, hematological malignancies and cellular therapeutics, inpatient rehab in rural areas, newer approaches to sleep apnea, Lewy Body Dementia, NASH fatty liver disease, and emerging flaviviral pathogens. During the convention he was also reacquainted with former medical students that are now physicians and other banquets at the convention. Dr. Knackstedt has been employed as physician at Harlan County Health System since April 2011. He cares for patients at Heartland Family Medicine Clinic in Alma and Oxford, the Alma Hospital and the Alma Good Samaritan Society nursing home. Patients of Harlan County Health System will beneﬁt from the latest technological advances that expand patients’ access to quality pharmacy services, made possible through a grant from The Leona M. and Harry B. Helmsley Charitable Trust. The Leona M. and Harry B. Helmsley Charitable Trust has awarded Harlan County Health System $165,875 for ePharmacy, a program that gives physicians immediate access to pharmacists 24 hours a day. The grant will be used to purchase equipment that connects local physicians with pharmacists. 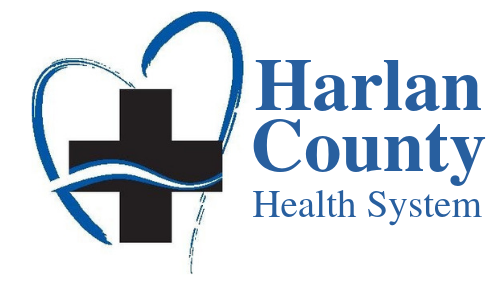 Harlan County Health System will receive equipment to implement ePharmacy. ePharmacy provides 24-hour access to hospital-trained pharmacists, making it possible for all prescriptions to be reviewed prior to the patient taking the medication, even when the on-staff pharmacists are not available. The Harlan County Health System hospital is a 19-bed Critical Access Hospital providing emergency, outpatient, inpatient, specialty clinic and surgical services from a spacious, modern facility. Adjoining the hospital is Heartland Family Medicine, a professional medical clinic staffed by a physician and two physician assistants. Heartland provides day-to-day medical care for patients of all ages from throughout the area. Visiting specialists travel to the HCHS regularly to provide cardiology, orthopedic, pulmonology and podiatry services. 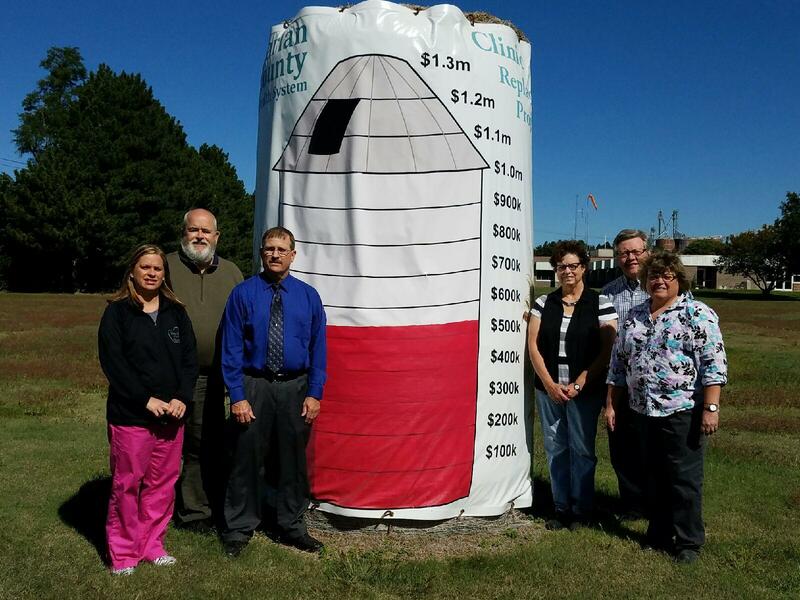 The Rural Healthcare Program of The Leona M. and Harry B. Helmsley Charitable Trust began awarding grants in 2009. The Helmsley Trust has awarded more than $298 million in grants to nonproﬁt organizations in the region through the Rural Healthcare Program. The Helmsley Charitable Trust, established in 1999, supports a diverse range of organizations with a major focus on health and medical research, human services, education, and conservation. To date, The Helmsley Trust has announced more than $1.7 billion in grants to charitable organizations since 2008. Many who attend sports events or watch them on TV have heard this phrase quite frequently and know what it means. BUT, did you know there are several people trained in concussion testing located at Harlan County Therapy Center at Harlan County Health System (HCHS) and that HCHS actually sponsors the testing for both Alma Public Schools and Southern Valley Schools? Drs. Finkner and Durr; PAs Stemper and Taylor; plus, Marisa Gulizia are certified by the IMPACT program. Let me introduce Marisa, PT, DPT, CSCS, Rehabilitation Director for New West Inspire Therapy located at HCHS. Marisa, her husband, Tony, and two children, Kortlyn and Kensley, reside in Alma. Marisa has extensive training in concussions. She attended the following training sessions: Advanced Vestibular Course (University of Pittsburgh, PA); IMPACT Testing; Sport Concussion Institute Training in Atlanta, GA; Spearheaded Concussion Focus Website and Lead Concussion Focus Team of Physicians, Athletic Trainers, Physical Therapists, and Sport Medicine Directors in Omaha, NE for three years; and was a guest speaker at the “Managing Concussions . . . a Team Approach” seminar hosted by UNMC in 2014. Concussions are very serious and if not treated properly or gone undetected can result in other major medical issues down the road. Solid links have been made between concussions and mental illnesses, which lead to severe depression and higher suicide rates. A concussion is a type of brain injury that can damage both physical and mental wellbeing. Although concussions usually are caused by a hit to the head, they can also occur when the head and upper body are violently shaken, as well as a fall or a blow to the body. The bump, blow, or jolt to the head can change the way the brain normally works, due to the impact causing the head and brain to move quickly back and forth. Sports related concussions are most common in football and girls’ soccer. Common signs of a concussion are: Headaches, Decreased Cognitive Function, Lack of Coordination, Pupil Dilation, Nausea, Blurred Vision, Bruising, Emotional Outbursts, Slurred Speech, and Disrupted Sleep Patterns. Due to the traumatic impact concussions have had on many notable athletes, concussion testing is mandatory for players to return to the game. Immediate Sideline Assessment by Athletic Trainer/Coach or other Medical Staff. Evaluation by the Athlete’s Family Physician. If concussion symptoms persist – evaluation and treatment by a Physical Therapist (PT). PT will assess symptoms, ocular motor system, vestibular system, balance, and reaction/coordination. Athletic Trainer/Coach/PT will use a “return to sport” protocol for concussions, which measures heart rate as athletes increase their activity level to ensure no return of symptoms with a heart rate that he/she would reach in practice or a game. Athletes can’t return to sports until released by a healthcare provider. This all sounds great, but how do you begin to avoid injuries and be successful? Here are a few tips to help you get started on the right path. Invest in a good pair of running shoes. You do not need the most expensive shoes on the market but you do need the appropriate size and support for your foot type. Visit a running store and have a qualified person match to you the right shoe is very beneficial. Running shoes need to be replaced every 300-600 miles. Start with a run/walk program. Build your running intensity and distance gradually. According to the Journal of Orthopaedic & Sports Physical Therapy in October 2014, it is recommended to not increase your distance by more than 10% per week to avoid some common leg injuries. Warm up and cool down. You should prepare your body to run, even if it is just a brisk walk. After your run, a cool down walk and stretching can help reduce muscle pain and decrease your recovery time. Cross training and days of rest. Incorporate other forms of exercise into your workout plan. Your body will need days of rest from the pounding forces of running. Running muscles will get a break; but, you will still obtain the health benefits of a workout by including other options such as walking, biking, swimming, elliptical, etc. to your exercise plan. Eat a nutritious diet. Eating a well-balanced diet will ensure your body has the energy it needs during your physically demanding workout. Be sure this diet includes good hydration. Drink your water!! Listen to your body. Running through pain, other than regular workout-related muscle soreness, is never a good idea. Take time off to rest and gradually ease back into running, should you experience pain with your running activities. Consult a physician if your symptoms do not diminish. These tips will help you get a good start on your way to a healthier you! When we hear the term “therapy”, most of us think of an injury and utilizing therapy to get rehabilitated from that injury. Therapy is being utilized for many illnesses as well, including Parkinson’s Disease (PD). Studies have proven that Physical, Occupational, and Speech Therapy can greatly help/improve functions for those who are suffering from PD. Parkinson’s Disease is a chronic and progressive neurological disorder affecting nearly one million people in the United States. Symptoms impacting motor skills include impaired balance and coordination, tremors, stiffness, and decreased speed of movement. People living with PD are at risk for increased falls and may find it difficult to complete daily tasks. Although there is no known cure, LSVT BIG is a form of evidence-based therapy that has been shown to slow motor deterioration and improve quality of life for those living with PD. LSVT BIG Programs were developed based on the effective speech treatment program LSVT (Lee Silverman Voice Treatment) LOUD. LSVT BIG is a standardized form of therapy delivered only by occupational therapists and physical therapists certified in this method. Harlan County Therapy Center located at Harlan County Health System is fortunate enough to have Mindy DeJonge, certified therapist for LSVT Big. Mindy attended classes and completed her certification in Denver, Colorado in July 2016. 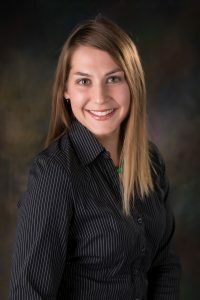 Mindy is originally from Macon, Nebraska and graduated from Creighton University with an Occupational Therapy Doctorate degree in 2010. Prior to moving back closer to home, Mindy worked at The Nebraska Medical Center in Omaha, NE and has now been at Harlan County Health Systems for almost four years. LSVT BIG treatment consists of 16 one hour long sessions, 4 consecutive days a week for 4 weeks. Daily homework and carryover exercises are to be completed by the patient outside of therapy. Treatments focus on amplitude or “bigness” of movement with high effort and intensity. The protocol is customized to address the unique goals and needs of each patient. Mindy is able to assist patients in any stage of the disease, across a wide range of disease severity and impairments. Research about LSVT BIG has been conducted over the past 25 years with funding from the National Institutes of Health. Results of these studies have indicated LSVT BIG patients have demonstrated improved balance, increased trunk rotation, increased walking speed with larger steps, and improvements in activities of daily living. Currently, LSVT BIG is being delivered in almost 40 countries by over 10,000 certified clinicians. For more information about LSVT BIG, visit www.LSVTGlobal.com or contact Mindy at 308-928-3002. And remember to THINK BIG! Ebersbach, G., Ebersbach, A., Edler, D., Kaufhold, O., Kusch, M., Kupsch, A., & Wissel, J. (2010). Disease, 2012, Article ID 391946, 12 pgs. Parkinson’s Disease: A Case Series. Phys Ther. 2014 Feb 20. 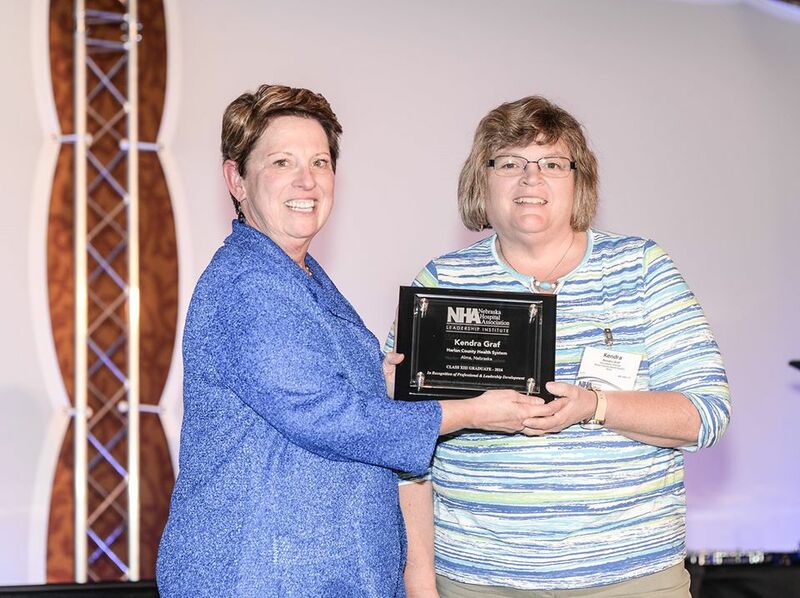 Training and Certification Workshop held July 15-16, 2016 in Denver, CO.
Each year, health care professionals from across Nebraska come together for the Nebraska Hospital Association (NHA) Leadership Institute, a 10-month program designed to instruct, inspire and invigorate. 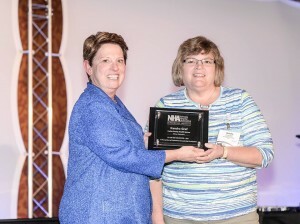 Participants establish peer-to-peer connections and lifelong bonds with classmates and faculty in this program that has been developed by the Nebraska Hospital Association in 2004. 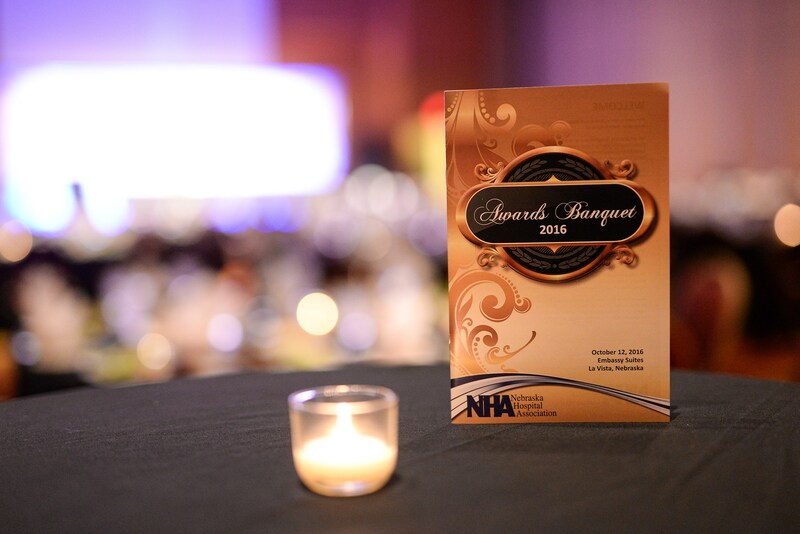 Graduates from the program exhibit exceptional leadership skills and are dedicated to influencing others toward service excellence in their roles as health care leaders. Kendra Graf, Foundation Director attended Class XIII and graduated from the Leadership Institute in October of 2016. Kendra was the fourth HCHS employee that participated in the Leadership Institute, following Manny Wolf who graduated in 2010, Suzanne Lans (2011) and Katie Fleischmann (2014). Kendra is the Director of the Harlan County Health System Foundation. The Foundation is a private, nonprofit, tax-exempt organization, whose purpose is to raise philanthropic support for capital and endowment needs of Harlan County Health System. The Foundation is committed to the wellness of the entire region. It seeks to develop lasting relationships with individuals, families and businesses who also value quality health care close to home. Under the leadership of Kendra and the Foundation Board, the Foundation is currently conducting a Capital Campaign to raise funds for a new medical clinic in Alma. This vital and badly needed Clinic renewal project will be paid for through the proceeds of the “Quality Care… Building on Excellence” Campaign. Instruction for the Leadership Program was provided by experts from diverse departments of Bellevue University including management, leadership development, business administration and health care administration and included Executive Leadership Coaching, a 360° Assessment, Individual Development Plans, 10 Core Courses in addition to online offerings. Participation in the institute provides the individual with skills needed for creative and innovative problem solving, ability to work with a diverse clientele, fosters motivation for continuous learning, heightens visibility of leadership positions/styles, and enhances the participant’s career both personally and professionally. In addition there are many benefits for the organization from having a well trained leadership staff, these include, improved recruiting and retention of staff, increased employee motivation, greater team building with reduced internal conflict and a potential for enhanced employee performance. Harlan County Health System is proud to have four members of the organizational leadership staff that have completed this prestigious program, learning many of the necessary skills to be exceptional leaders. Pictured: Steven Platt, Steve Knuth, Manuela Wolf and Julie Nelson. A local resident, who wishes to remain anonymous, has chosen to donate $75,000 to the Capital Campaign for the proposed new medical clinic. Asked what prompted this generous gift, the donor responded with a two-part answer. One factor was the individual's desire to see Alma grow in the future; not just maintain, but grow! They feel that a modern medical facility is an important part of a thriving community. Related to that was the feeling that this entire community had been good to the donor, and it was an appropriate way to give something back. Noting that it can be difficult to write one large check, the donor found a unique method to be both generous and practical. Purchasing a pre-paid life insurance policy and designating the Capital Campaign as beneficiary fit this giver's personal circumstances. In addition to the large donations that I have been writing about, I want to let everyone know how much I appreciate the individual contributions that we are receiving from our employees and community members. We have also been receiving individual donations and pledges from many community members and I am very thankful for all the work that is being done both by the Foundation Board, by Kendra, by our employees and volunteers to convince community members that a new clinic for Alma is a worthwhile cause. Currently the total of pledges and donations is $ 527,124. Left to right: Foundation Board Members Shannon Lynch, Pastor Paul Ferrarone, Jon Davis, Becky McKenzie, Bob Taylor and Foundation Director Kendra Graf. Not pictured are Board members Patrick Calkins, Jennifer Luther, Mildred Calkins and Jaclyn Daake.